Angelo Secchi (1818-1878) is the last of a series of Jesuit scientists who operated at the Collegio Romano where they had been instructed and is, at the same time, the first representative of a new scientific tradition which is still alive in modern astrophysics in Italy and all over the world. 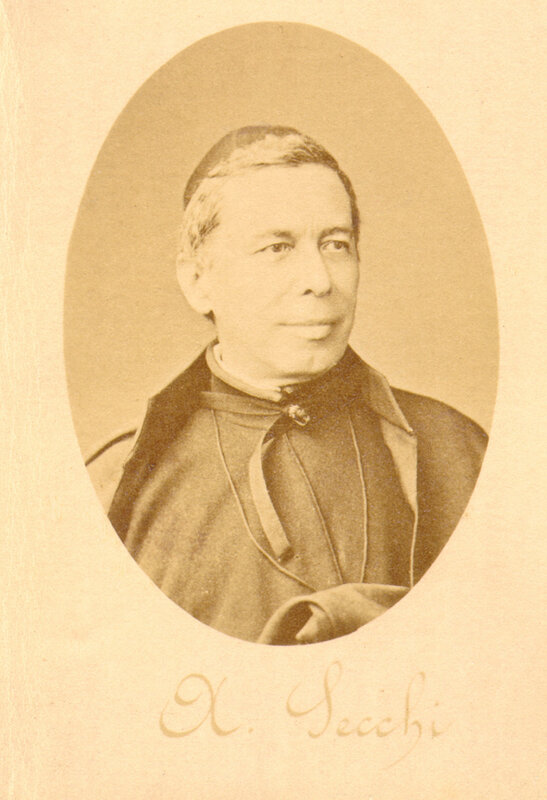 Angelo Secchi was born in Reggio Emilia on June 28, 1818, attended the local Jesuit College and entered the novitiate in the Society of Jesus at the age of fifteen. He stood out in scientific subjects; firstly taught Physics in Rome and Loreto and later became assistant of Father Giovambattista Pianciani (1784-1862), a physics lecturer at the Collegio Romano. Upon dispersal of the Jesuits, required by Pius IX in 1848 due to the events that lead to the Roman Republic during the Risorgimento, Secchi left Italy the year after being ordained a priest and went first to England, at Stonyhurst College near Liverpool, and thereafter to the United States at Georgetown College, in Washington DC. The American stay was of utmost importance for his scientific training, since it allowed him to get in contact with numerous American scientists and to keep abreast with the modern theories related to physics and dynamic meteorology. In 1849 he was called back to Rome to take charge of the direction of the Observatory at the Collegio Romano as successor of prematurely departed Father Francesco De Vico (1805-1848). Secchi, soon aware of the limitations of the structure that hosted the observatory, obtained permission in 1852 to transfer it in new rooms in the rooftop of St. Ignatius church. This relocation allowed him to renew the instrumentation and at the same time create a modern astronomic, meteorological and geomagnetic observatory. Secchi was aware of the importance of communicating the scientific results and relaunched the Memorie dell’Osservatorio del Collegio Romano (Memoirs of the Collegio Romano Observatory) where the main astronomic studies carried out in the observatory were gathered. In addition, he promoted the publication of the Bullettino Meteorologico del Collegio Romano (Meteorological Bulletin of the Collegio Romano), which collected the meteorological data of various stations and published contributions related to astronomy and related sciences. Reproduction of a table from Le Soleil which represents the spectroscope used by Secchi for his studies of solar physics. 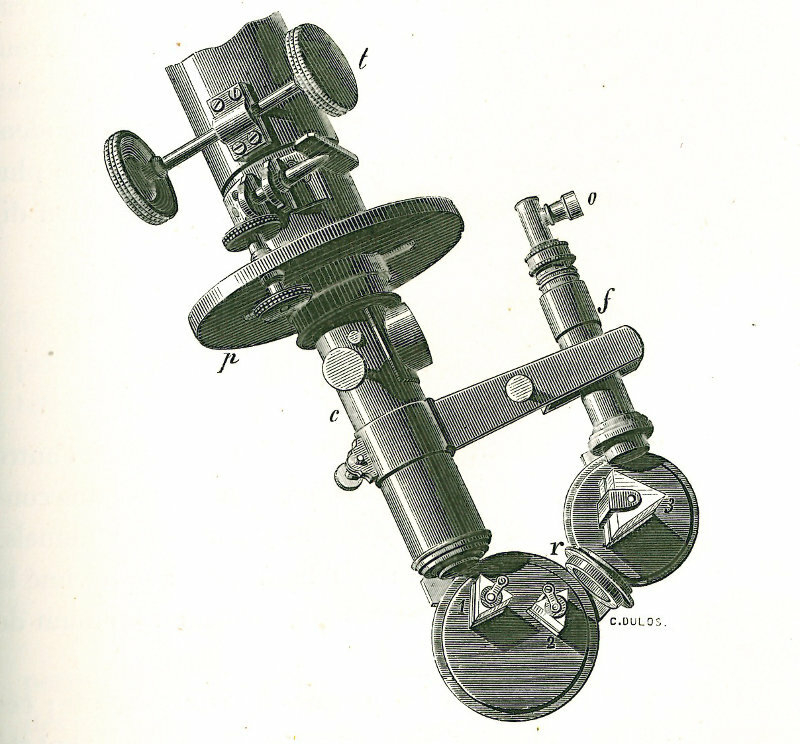 A combination of prisms, positioned in the focus of the telescope he utilized, splits the light such that the solar chromosphere is observed in one of the lines due to hydrogen. A firm believer in the application of new techniques, Secchi was one the first scientists to apply photography and spectroscopy to astronomy thereby making important contributions to solar physics and stellar astrophysics. He carried out numerous public assignments for the Papal Government, like the realization of the first Italian meteorological network – endowed with the daily transmission of the data by telegraph and a storm forecasting service; the measurement of the geodetic basis along the Appian Way and the construction of a tower at the top of Monte Mario to carry out the geodetic triangulation of the Papal State in the framework of the project designed to measure the degree of the central European meridian; the improvement of the lighthouse system in the Papal State harbors; the upgrading of the time service; the consultancy for the distribution of drinking water, for the placement of the lightning rods on the principal monuments and public buildings, for the fire-fighting measures in the major basilicas, and for the installation of electrical railroads in the Papal State. Secchi participated in the scientific expeditions to Spain and Sicily that allowed observation of the total solar eclipses in 1860 and 1870, respectively; in 1869 he collaborated with the Italian geodetic Commission for the measurement of the Central European Meridian and in 1870-72 he took part in the work of the International Commission of the Meter to define its standard length. In 1867, he received the Grand Prix at the Exposition Universelle in Paris with his meteorograph (the first automatic station for the collection of meteorological data he had devised) and was awarded the Légion d’Honneur. An important aspect of Secchi’s personality is apparent from his difficult and controversial role of mediator between two cultures, the catholic and the secular-liberal one, when a harsh confrontation between the Church and the new Italian State took place at the time of the Risorgimento. He was friends with scientists and secular politicians, like Giovanni Virginio Schiaparelli (1835-1910), Quintino Sella (1827-1884) and Pietro Tacchini (1838-1905). In particular, the intense scientific partnership with Tacchini gave rise to the idea of founding, in 1871, the Società degli Spettroscopisti Italiani (Society of Italian Spectroscopists) nowadays called Società Astronomica Italiana (Italian Astronomic Society). Worth of note is Secchi’s activity of promoting and popularizing culture in astronomy which he tried to disseminate with numerous public conferences and by setting up various sundials and solar clocks. During the years after the declaration of Rome as the capital of Italy, Secchi had to defend his Observatory from the risk of confiscation by the Italian State and had to face economic difficulties that did not allow him to carry out regular research programs. His health, already quite frail, was threatened by these events and Secchi died of an incurable disease after a short illness on February 26, 1878 a few days before becoming 60 years of age.